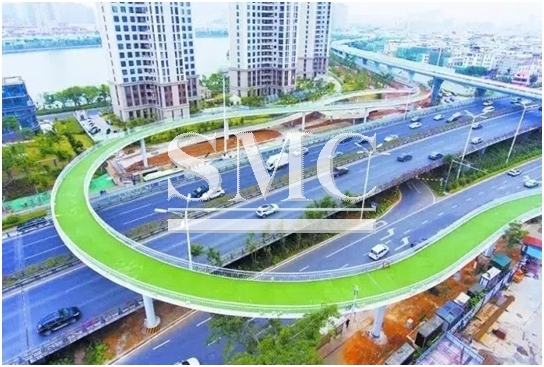 Xiamen, the South-East Chinese city has recently unveiled the longest aerial cycle path in the world. The path is a 4.8m-wide four-lane carriageway stretching for 7.6km with 11 exits connecting to six public transport hubs. Commuters who wish to use the system do not have to be an owner of a bike, there will be 355 cycles that are available for hire and will also consist of 253 parking spaces for private bicycles. Much of the pathway is beneath the elevated road used by the city’s rapid transit bus line, which gives shelter on rainy days. For safety, the paths have 1.3m guardrails and 30,000 lights to illuminate the path at night. One of the most innovative things related to the project is that there will be a “multi-sensor monitoring technology” installed, which when the bridge becomes to crowded will automatically close the gates to prevent it over-capacitating. The structure, which will be operated by the Xiamen City Public Bicycle Management Company, was designed and completed in six months. According to China.org, city authorities say the bike lane will be opened to the city’s 3.5 million citizens in the near future. Other cities have considered the idea of aerial bike routes. In 2011 UK firms Exterior Architecture floated the idea of a 220km “SkyCycle” system located over railway lines. The idea reportedly had the backing of Network Rail and Transport for London, but came to nothing – partly as a result of its £8bn ($10bn) price tag.